The Securities and Exchange Commission could lose $50 million in annual spending for technology upgrades under a new Republican administration. Legislation sponsored by House Financial Services Committee Chairman Jeb Hensarling (R-Texas), widely viewed as a blueprint for any Dodd-Frank Act rollback, would eliminate a reserve fund financed by SEC registration fees and used to modernize the commission’s outdated computer systems. 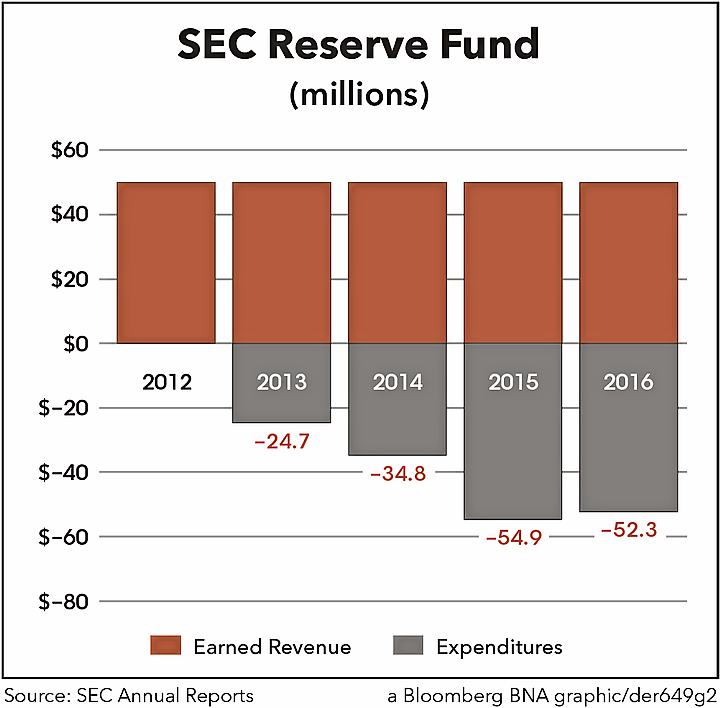 Advocates for the reserve fund—including current and past SEC chairmen, Democratic lawmakers and financial reform supporters—have a different point of view. They say the fund is needed to support multiyear IT developments at an agency struggling to keep pace with a technologically advanced financial industry able to make trading decisions in nanoseconds. “Currently, the SEC spends only a small fraction of what the big banks and investment firms spend on IT issues,” Rep. Jose Serrano (D-N.Y.), ranking member of the House Appropriations Financial Services Subcommittee, told Bloomberg BNA in an e-mail. He said that if the reserve fund were eliminated, the SEC would have trouble investing in critical IT priorities to protect the financial markets from cyberattacks and other abuses. White also emphasized in a 2015 letter to SEC Inspector General Carl Hoecker the need for the fund to support ongoing mission-critical IT projects that wouldn’t fall under the aegis of general funding for operations and maintenance. Like Hensarling’s Financial Choice Act (H.R. 5983), a House appropriations bill (H.R. 5485) calls for eliminating the reserve fund but would increase the agency’s budget by $50 million to account for the loss of funds. “[E]mergency reserve funds should be used for natural disaster emergencies and other crises, not discretionary priorities within a Federal agency,” a report attached to the bill says. House appropriators also pressed to eliminate the reserve fund in fiscal 2016 but ultimately cut $25 million from the fund instead. The SEC declined to comment on how the loss of the fund would affect the agency. Tyler Gellasch, founder of consultancy Myrtle Makena LLC and former counsel to SEC Commissioner Kara M. Stein, told Bloomberg BNA in a telephone interview that the reserve fund was explicitly created to redress technological limitations that were hampering the agency’s ability to oversee the markets. “It’s not as if the SEC just needs a software upgrade or two. The entire agency needs a comprehensive overhaul of what information it takes in and how it uses that information. It takes the SEC several phone calls, document requests, and weeks to figure out something that might take an average trading firm or research analyst two clicks,” he said. As to why the money was designated in a reserve fund rather than through appropriations, “[it] was Congress’s way of saying, ‘we don’t want to take money away from the SEC’s current staff to get the technology it desperately needs,” according to Gellasch. Barbara Roper, director of investor protection for the Consumer Federation of America, agreed that the agency is behind the times technologically. “If you take the view of the SEC’s budget since Enron, it’s gotten nothing but boosts, but in the long view it has underinvested in tech at times when markets were completely transformed by technology,” Roper told Bloomberg BNA in an e-mail. “There was really rapid growth in market technology in the 1980s, but the SEC’s budget was flat for that decade,” she said. Yearly budget numbers from the SEC analyzed by Bloomberg BNA back up Roper’s contention. The agency’s budget has increased over 300 percent since 2000, as critics of the agency have highlighted. But between 1980 and 1990, a period of rapid financial industry growth, the agency’s budget increased only $90 million, or 43 percent. 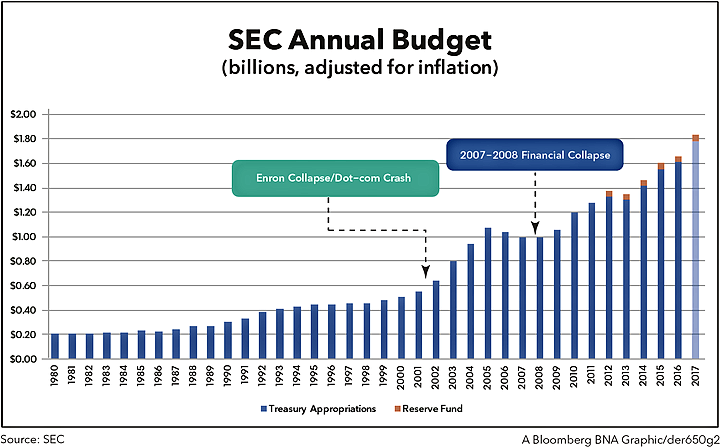 The majority of budget increases in the 2000s occurred in the years directly following major financial crises, including the Enron collapse, the dot-com crash and the 2007-2008 financial crisis. A memo from the Financial Services Committee put the total spent from the fund at $205 million, but SEC annual reports since 2012 only list $116.7 million in expenditures. Up to $50 million can be added to the fund yearly with a maximum fund balance of $100 million, although the agency hasn’t always spent all of the money. While the SEC isn’t required to get approval for making use of the fund, it has to notify the House Financial Services and Appropriations Committees within 10 days of committing to spend the money. According to SEC annual reports, the fund specifically has been used for modernizing the Electronic Data Gathering, Analysis, and Retrieval system; website upgrades; data analysis projects; high frequency trading analysis projects; enhancing the Tips, Complaints, and Referral system; litigation tracking improvements; and information security updates. SEC Chairman White has said the agency also plans to use the fund for construction of the Enterprise Data Warehouse, a data repository and predictive modeling project, as well as a Consolidated Audit Trail to integrate data from self-regulatory organizations for securities-related investigations. SEC Commissioner Stein, who helped create the reserve fund in her role as a Senate aide, also supported the Consolidated Audit Trail in the wake of the flash crash in 2010, which saw the Dow Jones drop almost 1,000 points and then immediately rally. The agency took months to investigate and analyze the incident.